Who's Who at The Scratching Post? The Scratching Post is a cat rescue charity, based in Waltham Abbey, Essex, but covering a much wider area. We have a charity shop in Enfield, we rely solely on charitable donations and are very grateful to all of our volunteers. Our policy is to ensure that no cat is ever kept in unsuitable accommodation while it is waiting for a home. Every cat's individual needs are catered for and the best expert help is provided. We never put a cat to sleep unless there is no hope of being able to save him or her with a good quality of life, as advised by our vets. Every cat in its own right is important and deserves the chance of a loving home and a happy life. Our pens are quite large giving each one freedom to move around, and we have open plan units with a small garden area for our longer term residents. The scratching post also deals with feral cats. These cats are trapped, neutered and returned to where they came from, or found a new site. Whilst they are with us, they are kept in an open plan enclosure, where they have space to run, hide and play. A charming tale of comedy, tragedy, and cat antics. This is the story of how a cat rescue charity started and its horrendous journey to the present day - from of course the cats' perspective! I promise you wont stop laughing and crying! As you would expect, all profits from this book to be donated to The Scratching Post. 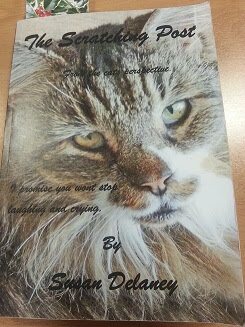 To get hold of your copy, please call into the The Shop or The Shelter/Cattery or email Susa at susan.delaney@aol.co.uk for postage costs, remembering to state your location. Please check ahead if you would like Susan to be there to sign your copy! The book is £9.99 including postage, UK. Would make a fabulous Christmas present for the cat lover in your life! The book is now also available on Amazon for Kindle. Please visit our shop to buy or donate. ...of beautiful cats and kittens just waiting for you to give them the home they deserve. You can donate money securely online using using your Paypal Account or any Credit/Debit card. Why not sponsor one of our long term residents. See our Sponsor a cat page for more details. The Scratching Post is a member of the Amazon Associates program. Buying through our website link will result in a small donation to the Scratching Post for any purchases made and at no further cost to yourself. Tell all your friends to shop from here! Thank you to everyone for supporting us this way. Please like us on Facebook and spread the word to all your friends! We have many feral cats and older kittens urgently looking for farms, stables etc to live in. You can choose something the cats need and send it directly to them (food or a toy etc) from their wishlist. Whilst our wishlist is on Amazon, items can be purchased elsewhere, of course, but hopefully this will give you an idea of what we need! There are loads of ways you can help us, and large or small, we love them all! See our Latest Mews , How you can help us and Facebook pages for even more ways to help, including an update on our VET ROOM APPEAL. Cats in their new homes, adopted from the Scratching Post. Emmerdale at the Scratching Post -Matthew Bose! A touch of glamour - SAM FOX! In the United Kingdom 74% of people support a charity during their lifetime but only 7% leave any gift to a charity within their will. Worse still, many pets are left behind without any provision. We get calls to houses where cats have been left behind because there is no-one to care for them, or the family simply aren't interested in caring for them, no matter HOW MUCH THEY MEANT TO THEIR OWNER or how well provided for the family are in their will. In some cases we have heard about cats being taken to the vet to be put to sleep - DON'T LET THIS BE YOUR BELOVED PET. Discuss your wishes with your family and then INCLUDE IT IN YOUR WILL. Leaving some of your estate to charity can also help reduce the inheritance tax you are obligated to pay. If you wish to leave us a lasting legacy, please remember the Scratching Post in your Will. Subpages (2): How to Contact Us Who's Who at The Scratching Post?